Say it isn’t so! The season’s cutest platonic relationship came to a grinding, crashing halt tonight. Gabby became the latest contestant to take a swipe at Christian, and miss. Yes, I know that it was confirmed tonight that Christian has a girlfriend, Emily, and that they are truly perfect for one another. Still, Christian and Gabby seemed perfectly matched in the game, like no other non-romantic couple I can remember. Gabby was there for Christian and Christian was there for Gabby. The two were a formidable strategic duo…until they weren’t. Oddly enough, it seemed like it was the loved ones challenge that sounded off some alarms in Gabby’s head that she needed to turn on Christian. She saw how supportive and nurturing he was towards Emily. It made Gabby realize that she had maybe been leaning a bit too heavily on Christian herself. Let’s face it: Gabby‘s reasoning was not wrong. She has been a major player in the game. We know that from watching at home. In the game, she would have had zero chance of winning had she not built her own resume of big moves. She correctly observed that she would be perceived as the “sidekick” to Christian, but the question became: Was now the right time to take a swing at him? It’s easy to answer “no” to that question seeing how it played out. I think it might have been the only workable timing, considering that Christian had an Idol that everybody knew about. The only way you can blindside him is during a vote where he is 100% convinced on who he’s voting for. In his mind, he did think that it should have been Alison. Gabby could have waited, but the closer Christian was going to come to the end of the game, the more likely he’d end up using that Idol. No, I think the timing was right…but the execution was obviously off. The key to it all turned out to be Davie, who interestingly doesn’t seem to know where his loyalties lie. Other than that, he’s playing a good individual game and he wants to be shielded all the way to the end. He sees that his best shield option is Christian, which is a correct assessment. Davie is likable, has been good in challenges, has a great social game, has found Idols and has positioned himself brilliantly in the game. Even still, Christian is the bigger perceived target. And tonight, when given the opportunity to form a Final Four alliance with Mike, Angelina and Nick after the reward, he tells us that teaming with them wasn’t in his best interest. He then reveals the plan to Christian, but then writes Christian’s name down. Look out for Davie, people. As for an explanation of that Christian vote? I’m assuming that after he told Christian of the tribe’s plans, he also told Christian that he was going to write his name down, knowing that Christian would play his Idol…this is the best way to keep Davie firmly implanted on the side of the “enemy,” a deep-cover agent for the forces of good (and by good, I mean Christian and Davie). Look, there’s no doubt that Christian is a genius and way smarter than I’ll ever be. But Gabby really should have owed her demise to Davie, not Christian. 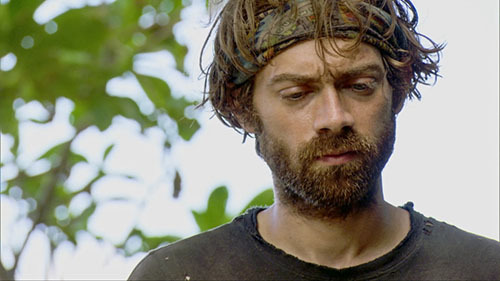 If not for him, Christian might have found himself leaving the game with an Idol around his neck, working through algorithms and theories as to how in the heck he just got voted out of the game. Davie is the one that outsmarted everyone tonight…it’ll be interesting to see if he can outlast the rest. Back to Davie, he is the game’s real wild card. It legitimately looks like Mike, Angelina and Nick are on-board to work with one another, thinking they have Davie as a fourth. However, he didn’t seem to like the idea tonight. He still keeps this open as an option since he voted for Christian tonight. 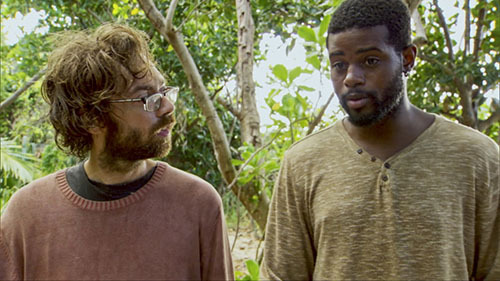 On the other side of things, he still has Christian on his side…although Christian at this point is suddenly very unlikely to go much further in the game without some Immunity wins. Remember, Christian has to return to camp knowing that three people (four counting Gabby) wrote his name down. He doesn’t have anyone left in the game other than Davie. But Christian may hold the key to Davie blowing up that other Final Four alliance, should Davie really not want to go to the end with the likes of Angelina, Mike and Nick. Episode Take-away: Just one episode remains leading up to the two-hour Finale Episode on Dec. 19! This was another good one, and I for one was very sorry to see Gabby go. I really liked her! I also was sympathetic to her position in the game and I like the fact that she went out trying to make a big move. But like Nick said at Tribal, just because you make a big move doesn’t mean it’s a good move. Gabby was over-matched strategically, not by her game-partner Christian, but by her other, less obvious ally, Davie. Did I mention we need to look out for him in this game? 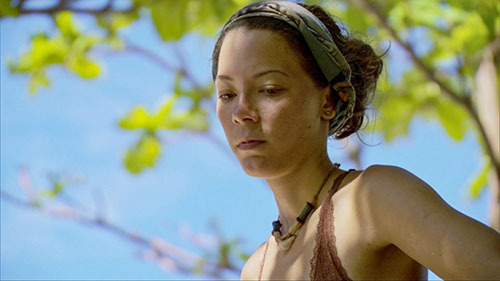 Next Week’s Episode: Like CBS and the Survivor team are going to give anything away at this point in the season! The preview reiterated that this is still anybody’s game. We’ll just have to wait and see how things shake out. Quick Note! I appreciate that you are reading this recap! 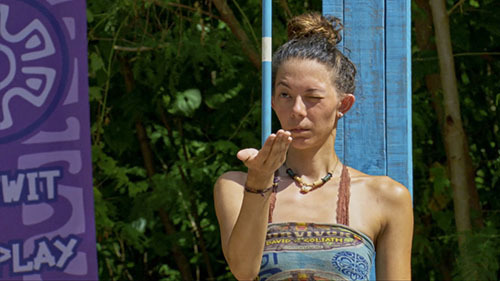 But all season long, remember to return right here to Reality Tea for my FilmSurvivor Podcast on Thursday, where you can listen to my full exit interview with the eliminated contestants. This week I will be chatting exclusively with Gabby Pascuzzi. Those that have followed me also know that I am a RottenTomatoes-approved film critic, and I encourage you to check out my weekly movie reviews as I am also the national film critic for AXS.com and am a movie critic/TV personality in the Detroit area. As always, the easiest way to get all of my Survivor coverage and movie reviews is to follow me on Twitter – @tomsantilli – or on Facebook. 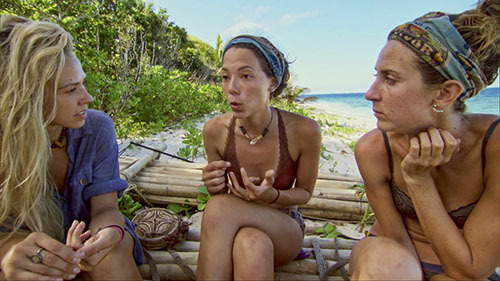 TELL US – WHAT DID YOU THINK OF TONIGHT’S SURVIVOR EPISODE? DID GABBY HAVE NO CHOICE BUT TO GO AGAINST CHRISTIAN? 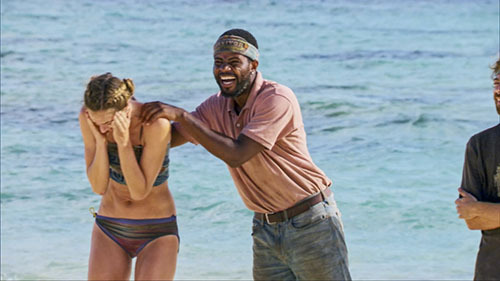 AND WHO ARE YOU ROOTING FOR TO WIN SURVIVOR?